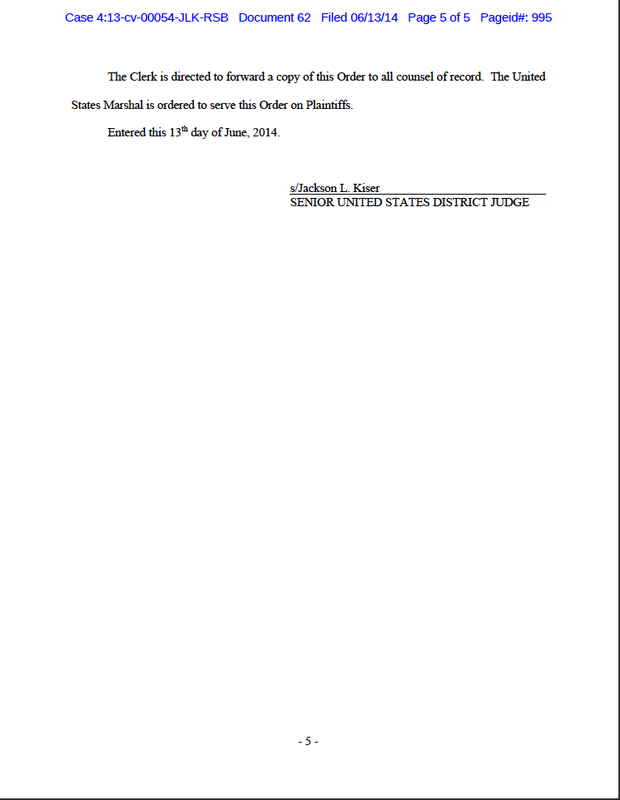 Judge Jackson L. Kiser sends U.S. Marshall with comments on my Blog. 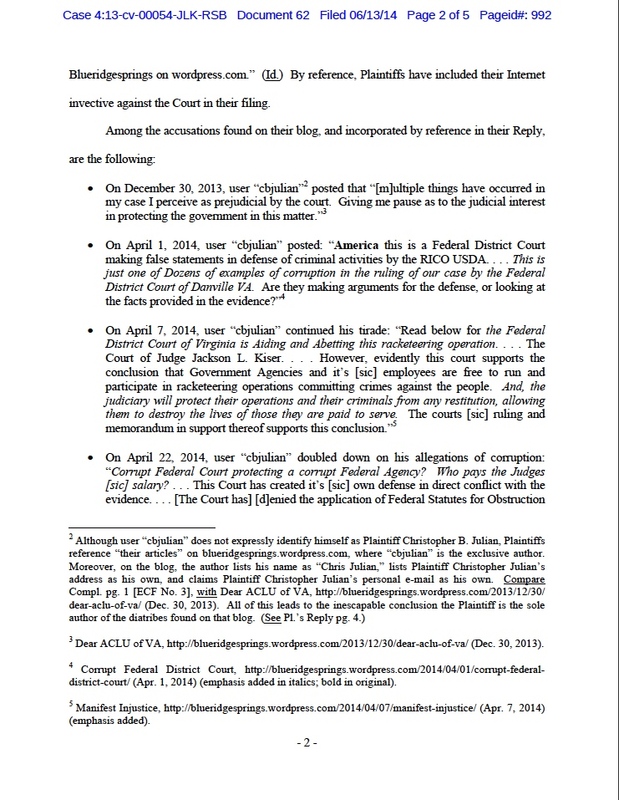 Read the filing Judge Kiser refers to on page 1 Here Reply to Response DeCoster Sanctions.. Pay careful attention to what the filing actually says. Update 3-3-2016 I invite you to read the blog post to which Judge Jackson L. Kiser has referred in his show cause order. I believe you will find that contrary to his statement of being wholly unsubstantiated in each article the allegations are backed up by supporting documentation and evidence. Secondly, if you carefully read the statement made in the court filing you will see that Judge Jackson L. Kisers allegation I called him and his court criminal and corrupt is not accurate but, was as he runs his court based entirely on his personal assumption and bias. Nowhere in that statement was his name or any reference to his court room made. It’s a statement no different than one repeated countless ways through out the ages on issues with court neutrality and objective application of the law by countless judges. Update 5-3-2017 It should have been noted long ago. 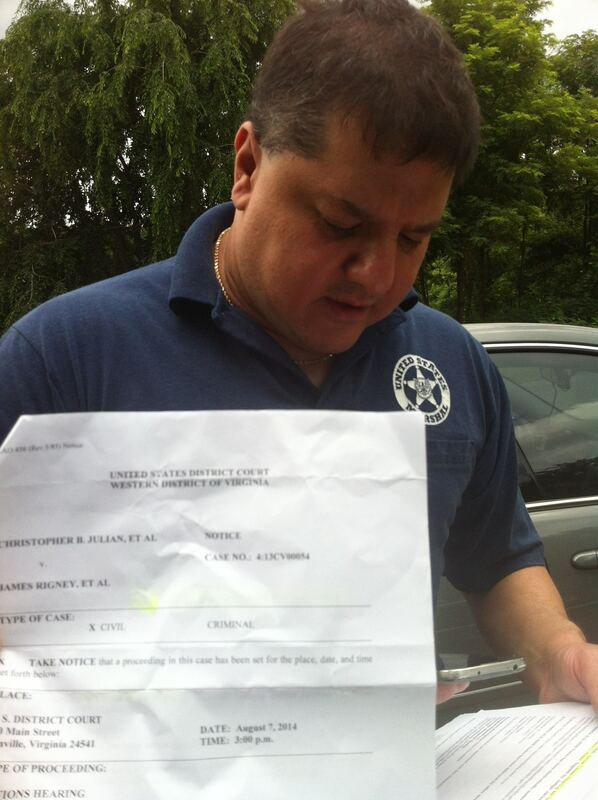 Held infront of the Marshall is a document showing that plaintiffs were already scheduled to appear in court on the date of the Show cause order the Marshall is serving. I.E. Judge Kiser sent the U.S. Marshall purely and solely for the purpose of intimidation. Really nice public / Government employee rare find in Virginia. CHRISTOPHER B. 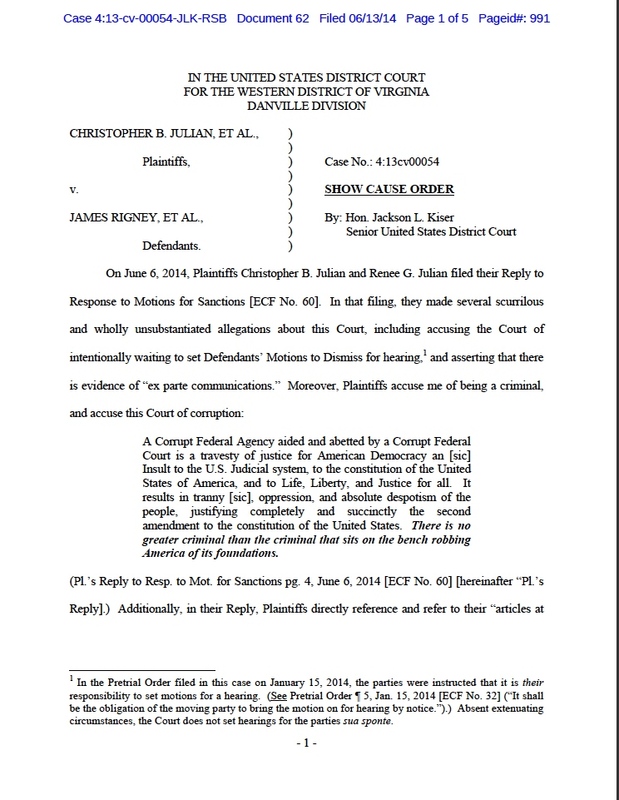 AND RENEE G. JULIAN’S REPLY TO RESPONSE FOR SANCTIONS OF KATHERINE DECOSTER. REPLY TO RESPONSE TO MOTIONS FOR SANCTIONS. Comes now Plaintiff’s s Christopher B. and Renee G. Julian in opposition to Katherine DeCosters response to motions for sanctions. Rule 5(b)(2)(E) is very specific “If the person consented in writing” Plaintiffs never consented in writing to any electronic form of service. Plaintiffs simply did Ms DeCoster a favor letting her know of her errors. Plaintiffs had no reason to object to her email and a response was merely a common curtsey. It is plainly direct, obvious, and observable that plaintiffs were made aware of these motions only by the courts service of the Roseboro notice. Plaintiffs would not have had such a notice had they not been Pro-Se. Plaintiffs never had any opportunity to make any motion or any reply with regards to Ms DeCosters motion for an extension of time to respond as the Court granted the motion without Plaintiffs having any knowledge of its existence. There is no way now nor was there ever anyway for this error to be justly corrected. 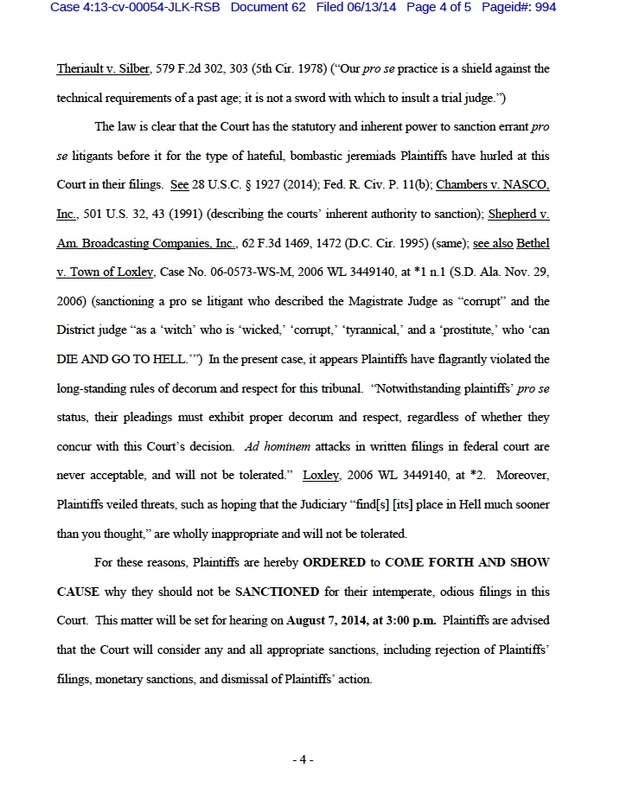 The Jonesboro notice was the one and only reason Plaintiffs responded to the Motion to dismiss and plea of immunity. This was for Plaintiffs a very serious issue. It put Plaintiffs case in a very precarious situation as the Defendants motion was for failure to state a claim and given the lenience gifted in the filing of the complaint Plaintiffs could not jeopardize the case with a motion for default judgment. The Court new Plaintiffs were Pro-Se. This is evidenced by the issuance of the roseboro notice. The Court Clerk had informed Plaintiffs on inquiry Judge Jackson L. Kiser never grants Pro-Se Plaintiffs access to electronic filing. The Court knew when the Defendant filed the motion for extension of time to respond that it had not been served for this reason. This is further evidenced by the time the Court allowed for Plaintiffs to file an opposition ref dkt 14 & 17 and dkt 21 & 23 as opposed to the length granted when the USAG made the same motion; and note the Holiday weekend in the filing of dkt 21. The Court approved this motion knowing it was not effective. Dkt 17 Since Plaintiffs had no knowledge this motion had been filed until after receiving the roseboro notice from the court dkt 18 Plaintiffs never had any opportunity at all to oppose this motion. Motion to Dismiss for failure to state a claim and plea for Sovereign and qualified immunity. This Motion placed Plaintiff’s in a very precarious position jeopardizing elements of our case. Plaintiffs had to respond to countless issues Sovereign Immunity, Qualified Immunity, failure to state a claim, etc raised in defense of Ms Johnson that were by rule subject to summary judgment as they were issues raised outside of the complaint, hence the rosesboro notice. Furthermore, Plaintiffs were subjected to numerous allegations in the motion of faults in the filing directly attributable to the courts instructions not to make legal arguments or citations. Had plaintiffs motioned for default judgment, a viable motion in response to failure to effect service, however, the court could have, and, we now know, would have dismissed Ms Johnson on failure to state a claim. Was that the courts prime objective? 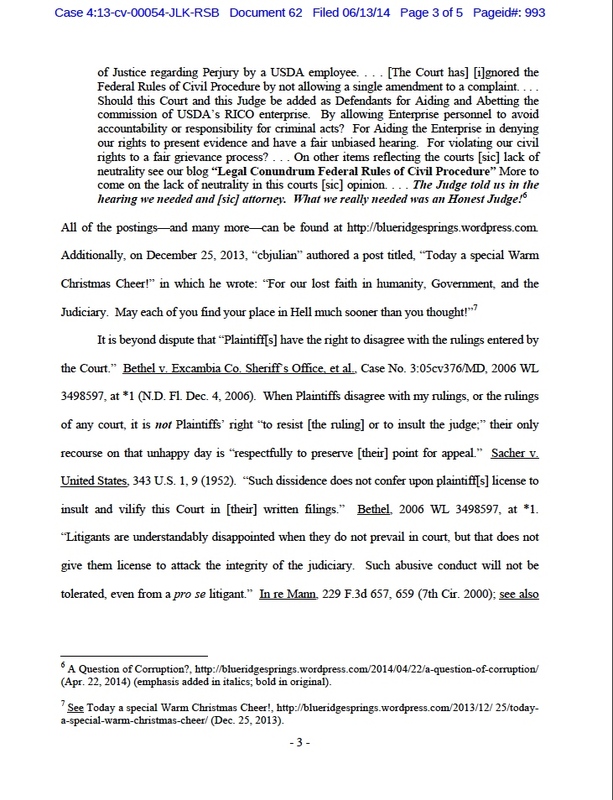 Defeating the primary reason Ms Johnson was named in this suit, Ms Johnson’s participation in aiding and abetting RICO USDA in the Commission of the enterprises objectives, an argument that had been completely pulled from the original complaint to comply with the Courts instructions not to cite statues, cases or make legal arguments. A compliance with the courts instructions, which caused Plaintiffs serious undue and unnecessary complications, and has significantly, delayed the entire process while causing significant physical and mental stress to plaintiffs as well as stealing precious time from our lives. The Courts actions with regard to these two motions together with the Courts action approving the USAG’s motion for extension without granting Plaintiffs a single day of the Clerks Office being open to file an opposition, when the court clerk had been informed plaintiffs were attempting to file a responsive motion Exhibit AT. Plaintiffs viewed these actions as biased and prejudicial treatment by this court which resulted in Plaintiffs contacting the 4CCA on 11/14/ 2013 Exhibit AU attempting to file a grievance for prejudicial treatment by this court. Additionally, two articles on the experience were published on the internet “Legal Conundrum by Federal Rules of Civil Procedure 5(b)2(e) on January 1, 2014 and “Op Ed for the Federal District Courts” on January 15th 2014 after being denied publication by the Wall Street Journal. One additional article “ The Weak” discussing the experience was published on January 7, 2014. It is further worth noting that after all the motions had been filed the Court did not act to make a ruling and the moving party never motioned for a hearing or advised the court as prescribed by local rule 11(b). Did the Court and the Defendants council wait intentionally? There is absolutely no way to prove these acts were not coordinated between the court and the Defense Councils. And there is evidence in the docket of ex parte communication. Everyone is welcome to read any of our articles at Blueridgesprings on wordpress.com There will be many more to come. Up-Date 4-26-2017 these are all facts that demonstrate bias on the part of this court. A Corrupt Federal Agency aided and abetted by a Corrupt Federal Court is a travesty of justice for American Democracy an Insult to the U.S. Judicial system, to the constitution of the United States of America, and to Life, Liberty, and Justice for all. It results in tyranny, oppression, and absolute despotism of the people, justifying completely and succinctly the second amendment to the constitution of the United States. There is no greater criminal than the criminal that sits on the bench robbing America of its foundations.